Rich and fragrant, chicken soup is liquid gold. 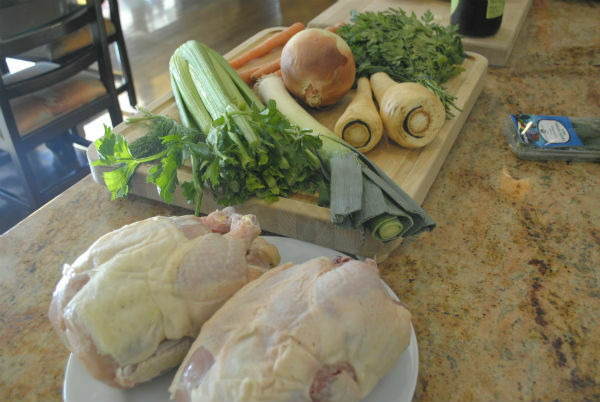 When you make soup, start with fresh ingredients, real chicken, vegetables, and water. You don’t need bullion cubes with all that extra salt and perhaps other artificial ingredients. I make a large pot of soup and freeze some of the pure golden liquid for future uses. With Sukkot coming, and eating outside the plan, soup is a good thing to put on the menu to ward off the chill in the night air. Place water in stock pot over high heat and bring to a boil. While waiting for water to boil, prepare chicken and vegetables. Clean chickens very well, removing any excess feathers. Discard gizzards and necks. Reserve livers for another use. 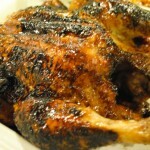 Place chickens in stock pot. Bring water back to a boil, skim all foam, and scum as it rises to the top. Discard foam and scum. 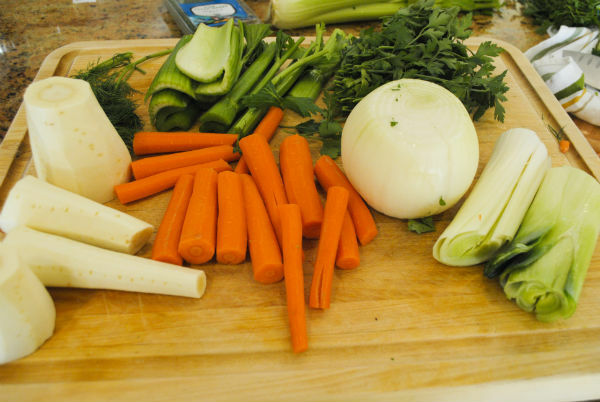 While you are skimming soup, continue preparing vegetables. Cut parsnips, carrots, and leek in halves. Slice onions by making a cross but not going all the way through so that they will stay whole. Cut each celery rib in two or three large chunks. Tear off parsley leaves from stems. When there is no more scum forming, and soup looks clear, add washed and prepared vegetables. Throw in garlic cloves. I leave the vegetables in big chunks so that they are easily removed when the soup is finished. Let the soup simmer for 2 to 4 hours and skim the yellow fat that rises to the top and coagulates. If you make this a day or two before you need it, you can refrigerate soup and all the fat that remains will congeal on the top where it is easy to lift off. 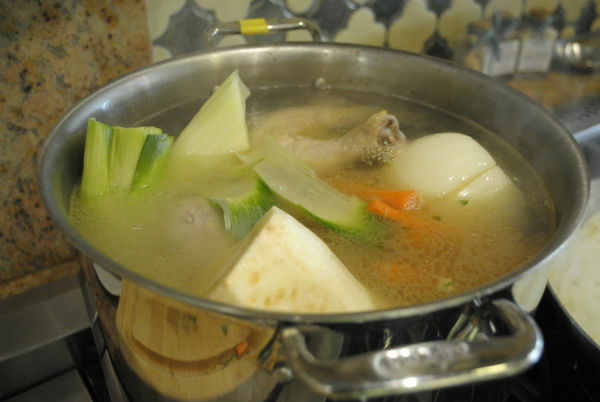 Remove all chicken, bones, and vegetables before using stock. Discard bones, skin, and mushy vegetables. Season clear stock with salt and pepper to your taste before serving. 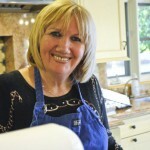 You can serve this as soup by adding matzo balls or noodles, and adding back in some chicken, shredded. It can be the base for any kind of soup such as tomato, or mushroom, vegetable, or you can use it when recipes call for stock. 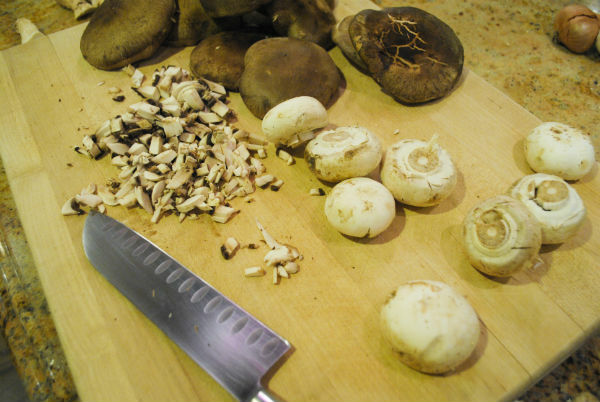 Clean mushrooms, slice in thin slices and then, cut crosswise into small dice. Pre-heat a large sauté pan on high. Mince shallot and garlic. Add olive oil to hot pan and immediately add mushrooms. Stir mushroom with two wooden spoons or bamboo stir fry paddles. Mushrooms should not release any liquid but just turn golden. Add in garlic and shallot, and then stir. Add in parsley, stir. Season with salt and pepper. 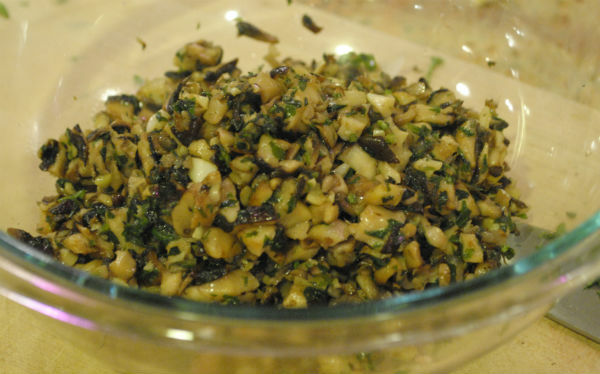 When mushrooms are sticking to pan and thoroughly cooked, deglaze with Tio Pepe. Remove pan from heat when Tio Pepe has evaporated. Place cooked mushroom filling in a bowl to cool off. When filling is cool, open package of wrappers. Place one wrapper on work surface. Prepare a small bowl of water to dip your fingers in. 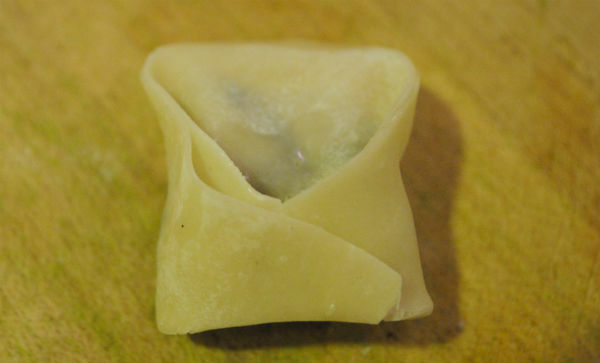 Dip you index finger in bowl of water, then paint one right angle edge of the wrapper dough with water so that when you fold the dumpling it will stick together. 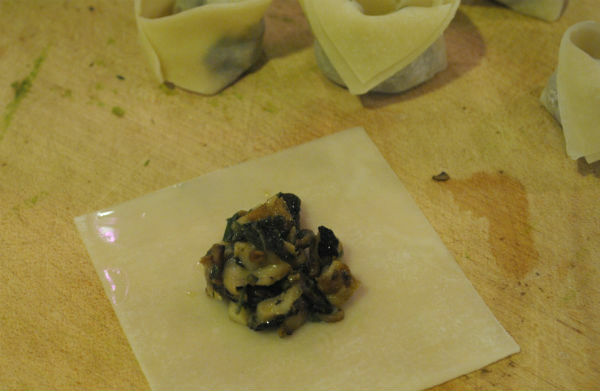 Place one teaspoon (the kind you eat with) of mushroom filling in the center of dough and fold in half to form a triangle, leaving one corner un-stuck. 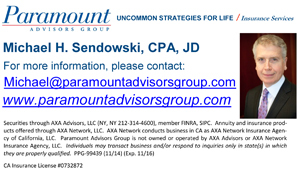 With the longest side of the triangle facing you, fold in the two points collapsing one point into the unsealed opening of the other point. Seal with water. 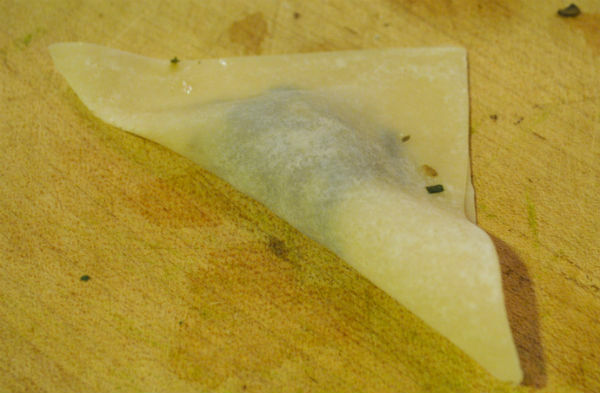 Fold over top of the triangle and place dumpling on a plate sprayed with olive oil. Repeat until you have made enough dumplings for as many bowls of soup as you have guests, times three (three dumplings each). 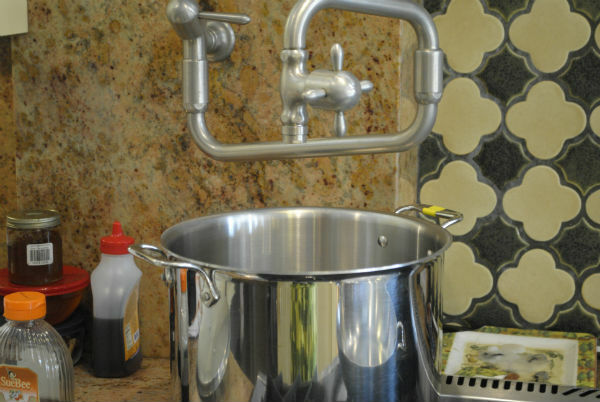 Bring a large stock pot full of water to a boil. Salt the water with a half a teaspoon. 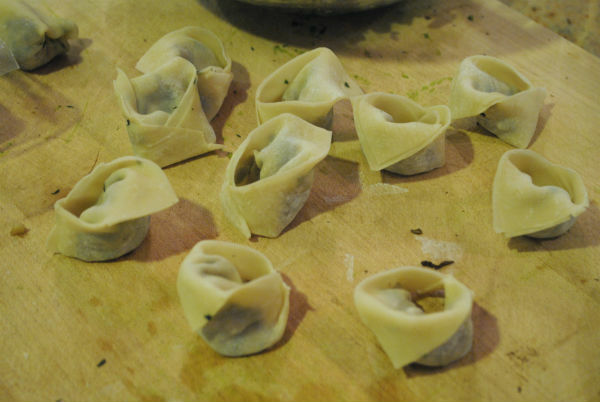 Place dumplings in water and cook for about 3 to 4 minutes. 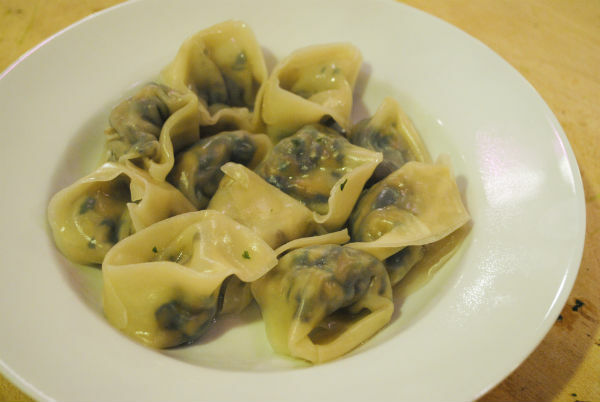 Carefully remove dumplings and place on a plate sprayed with olive oil. 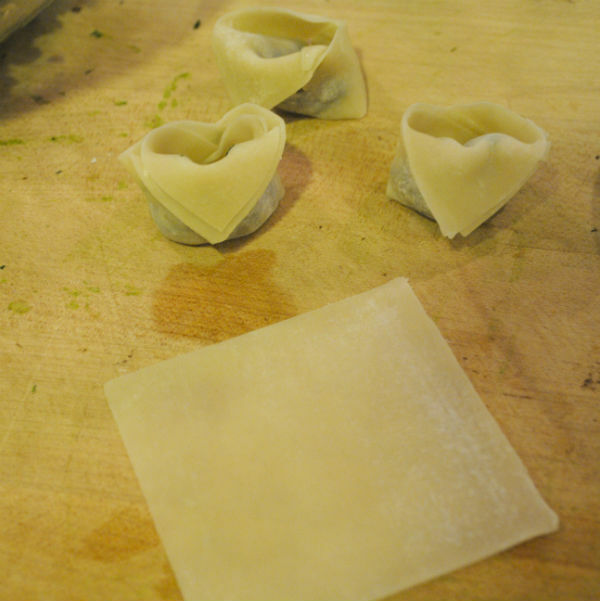 You may make dumplings a day ahead and refrigerate. 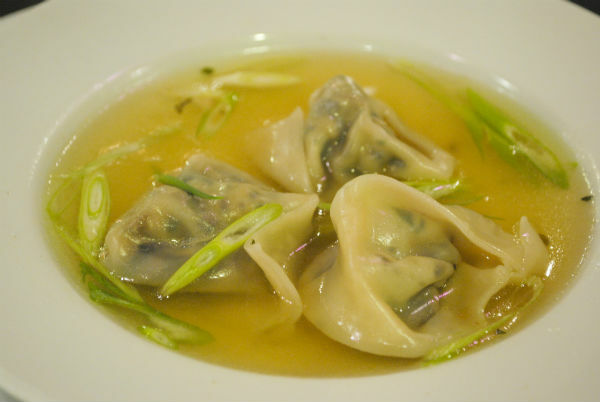 To serve soup, heat soup, place three room temperature dumplings in bottom of soup bowl, ladle hot soup into bowls. Garnish with slivered green onions, scallions. Serve.